I knew I wanted to make some type of noodle/stir-fry dish with a sweet-spicy-savory-tangy sauce, but I wasn’t thrilled about any of the recipes I came across. So, I threw a few things together – paying attention to amounts and making notes in case it worked out and I wanted to share with you, and it worked out! I love it when that happens! Love it even more when I’m not the only one in the house who thinks it’s yummy. For lack of a more creative idea, I’m calling these Asian Noodles. Any configuration of veggies would work, and you could add tofu or tempeh as well for extra protein. To make it super easy, Trader Joe’s sells packages of pre-shredded cabbage and carrots. I’d use two packages of cabbage. Typing this up makes me want to make and eat it again! The sauce for these noodles is nice and light, and better yet, low-fat, without oil. In a large pot cook noodles according to package directions. Meanwhile, combine tomato paste, water, garlic, vinegar, soy sauce, maple syrup, molasses, peanut butter, lime juice and chili paste, until mixed well. In large skillet or wok, sauté onion for about 3 minutes, adding small amounts of water to unstick and deglaze (see Notes). Add cabbage and carrots, and cover to lightly steam about 5 minutes, stirring a few times. Add vegetables and sauce to cooked noodles and toss until well coated. Serve and top with chopped peanuts and scallions if desired. I prefer to use a dry wok for this dish. If you use a well seasoned wok, it becomes naturally anti-stick and no water is necessary. The high heat sears the vegetables quickly and makes them more flavorful than steaming. No need to cover and steam with a wok. A good stainless wok is definitely worth the investment. 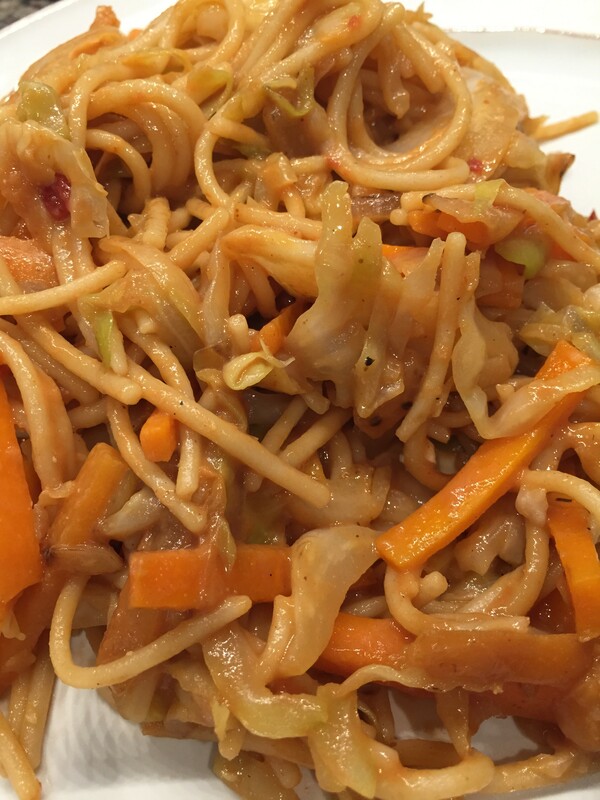 This entry was posted in Blog, Recipes and tagged low-fat, oil-free, rice noodles, spicy, sweet-n-sour, vegan by Shelly Detken. Bookmark the permalink.